By Allan Fox: Former three division belt holder Adrien Broner (29-1, 22 KOs) says he’s targeting Marcos Maidana, Manny Pacquiao, Juan Manuel Marquez, and Lucas Matthysse in the near future. Broner, 25, says he wants to avenge his loss to Maidana first, as that’s a loss that he wants to get behind him. Broner was beaten by Maidana last year in December by a 12 round unanimous decision. This led to Maidana getting two back to back fights against Floyd Mayweather Jr, fights that Maidana didn’t do that badly despite losing both of them. “I want to fight Pacquiao, Marquez, Matthysse, and Maidana again. Matter of fact I want to fight Maidana first to get you out the way,” Broner said on his twitter this week. It’s probably not a good idea for Broner to fight Maidana again right now because Maidana is looking a lot better than Broner right now. 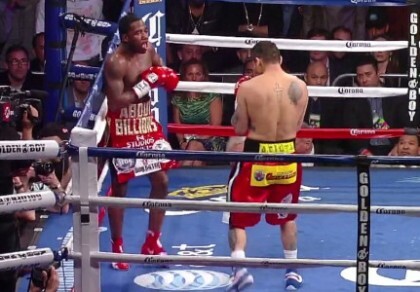 Even in Maidana’s last defeat against Mayweather in their second fight, Maidana still looked far better than Broner. He’s got too much power, too much size, and too much talent for Broner to be mixing it up with him. Maidana isn’t a lazy fighter, and he’ll likely outwork Broner for a second time and give him a worse beating than in the first fight. Broner has Al Haymon as his adviser which means that the chances of Broner getting fights against Pacquiao and Marquez pretty impossible. Haymon likely won’t green light either of those fights. Marquez is on the verge of retirement, and if he does fight again it’ll be against one of the welterweight champions like IBF champ Kell Brook. Marquez isn’t going to likely agree to fight Broner especially with his name still being partially tarnished by his loss to Maidana. Since his loss to Maidana, Broner has fought twice in beating Carlos Molina and Emmanuel Taylor. Broner looked poor in both fights, although he did show brief glimpses of talent in the Taylor fight. Broner doesn’t look like the same fighter he once was when he was fighting at super featherweight and lightweight. At 140, Broner is sluggish and fights too much off the ropes, as if he lacks the stamina to stay in the center of the ring to fight for three hard minutes of every round. It’s not likely that Haymon will Broner fight Maidana right now. Haymon seems to be positioning Broner to fight for one of the light welterweight titles that IBF/WBC champion Danny Garcia gives up when he moves up in weight to the welterweight division. Haymon isn’t going to mess things up by putting Broner back in with Maidana and watch him lose for a second time. Haymon has got to know that Broner would lose to Maidana no matter how many times they fought each other.